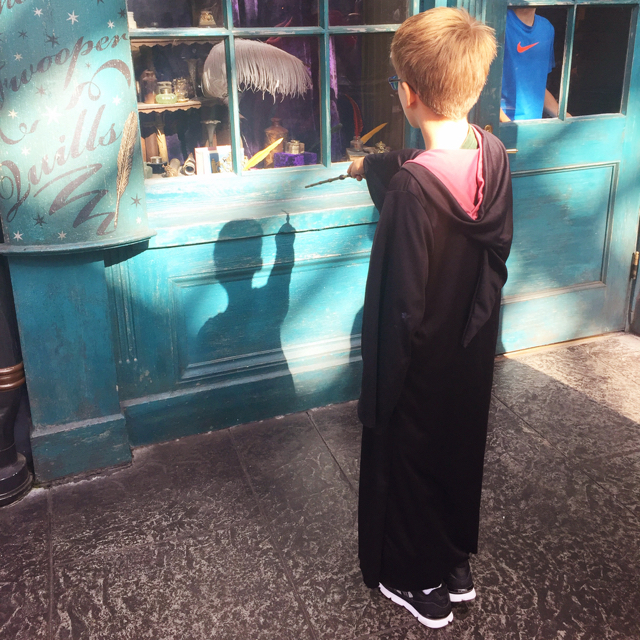 I thought I’d just get it out of the way in the title of this post: I was completely gobsmacked by the Wizarding World of Harry Potter at Universal Orlando Resort. It delivers on every promise of attention to detail and delicious, witty fun that the books and movies do. If you’re a fan of either or both, you should get yourself there. But I’m getting ahead of myself. 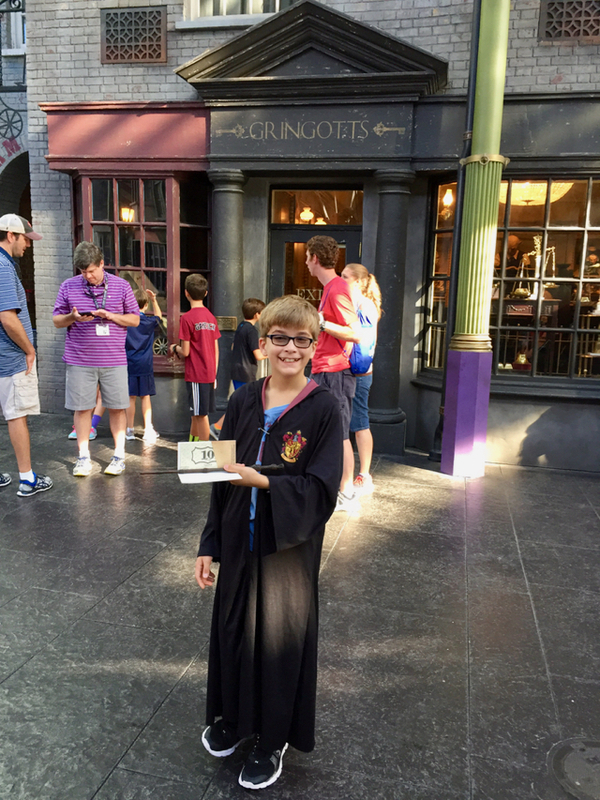 I explained in an earlier post that although my family does not generally choose to go on theme park vacations, (yep, I’m an official Theme Park Doubter) my husband Matt and I gave our son Teddy the gift that many children want for their 11th birthday – a trip to Hogwarts. 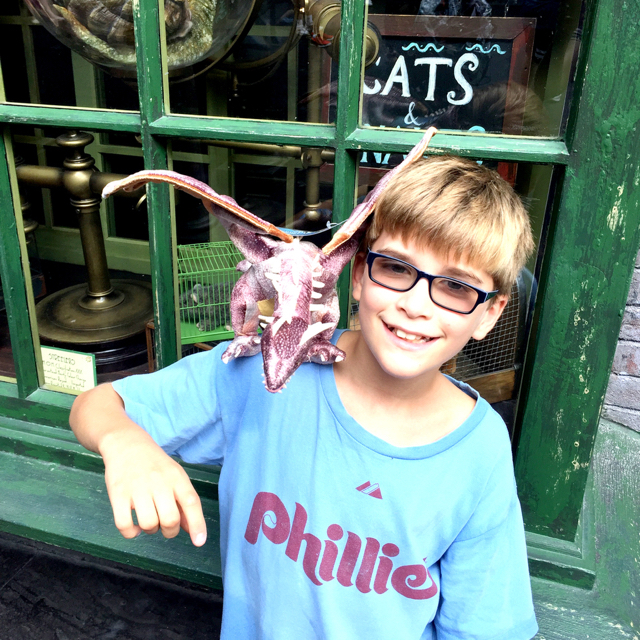 And the buzz about the Wizarding World of Harry Potter was so positive that even his 14-year-old brother Tommy was excited to come along. But I don’t think any of us anticipated quite how much fun it would be. Let’s start where my family did on our fall 2016 visit to Universal Orlando Resort: in Diagon Alley. If you stay on-site at Univeral Orlando, you can get into the theme parks an hour before the general public does. I highly recommend taking advantage of this, or if you stay elsewhere, arriving at the parks right when they open. Not only is it cooler earlier in the day, you won’t find the crowds that build up as the day goes on. A prime spot to begin your first morning, as we did, is at Ollivanders Wand Shop in Diagon Alley, which is in the Universal Studios Florida theme park. Boxes of wands stretch heavenward. 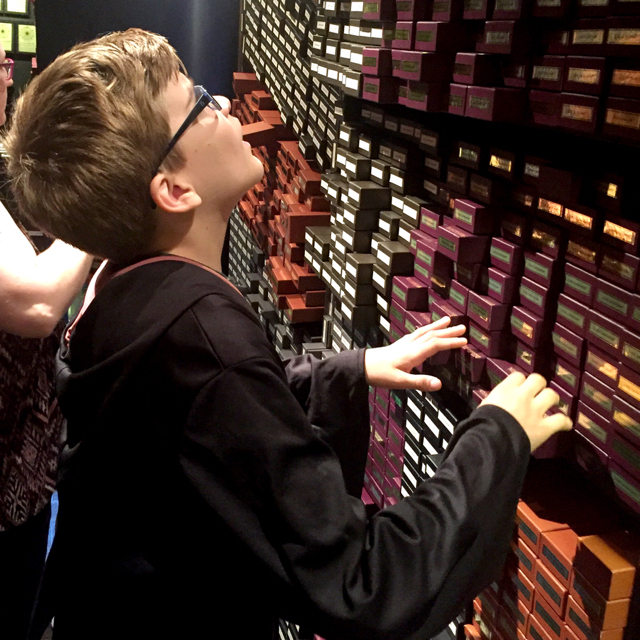 You can choose which character’s wand you want or if you’d prefer, select a custom one of your own. Either way, spending a little bit more money for an interactive wand is definitely worth it. These wands come with their own map and instructions to show you how they can be used around Diagon Alley or Hogsmeade to cast spells in various windows. I don’t want to ruin the surprise of all the spells, secret and otherwise, that there are to cast using an interactive wand. But I will share that like the first-year wizards at Hogwarts, owners of interactive wands can practice the wingarium leviosa spell on a feather. Just watching Teddy’s delight as he cast his spells throughout the park (using Dumbledore’s wand no less!) was worth the trip to Florida. 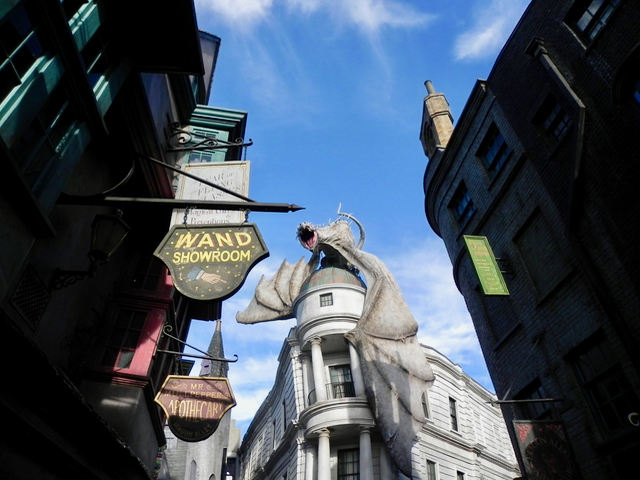 The goblin bank Gringotts dominates Diagon Alley, wearing, as it does, a huge dragon on the roof (if you’re not familiar with the books or movies, this particular part of the story comes in the last one of both). The only ride in Diagon Alley is contained inside Gringotts and if you’re like us you’ll want to go on it more than once. For one thing, just waiting in line is fun. That’s because you walk through the entrance hall, with its impressive chandeliers and collection of grumpy goblins busily tabulating in large account books. Further along you’ll find a display of Daily Prophets to bring you up to speed on all the news. 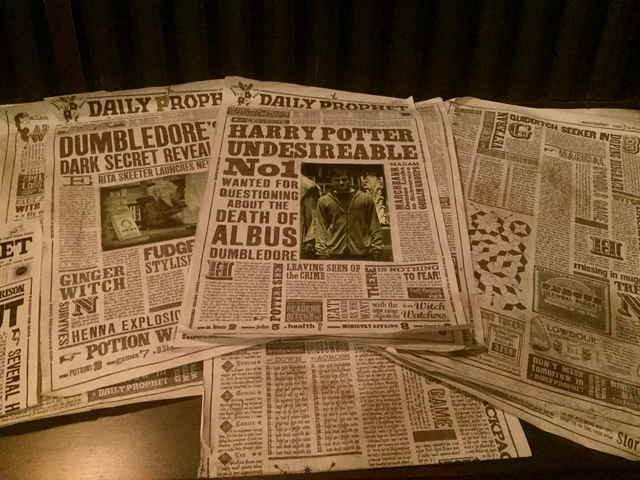 These are right next to the goblin Griphook’s office (he didn’t seem to be around the day we visited). 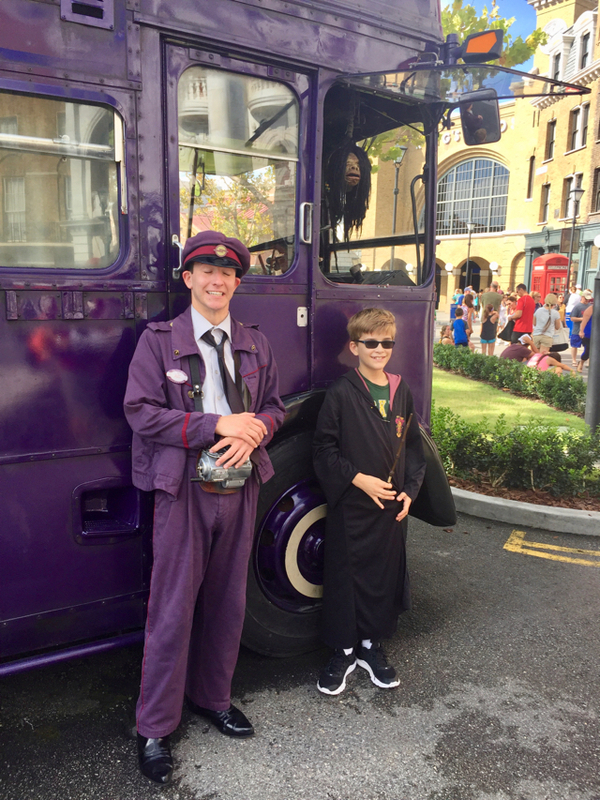 The ride itself is high-speed, immersive fun trip down into the vaults with visits from Bill Weasley, a certain very evil wizard, and a dragon. It’s a little intense, but even my timid younger boy loved it, although the drop into the dark at the beginning, just like in the “real” Gringotts, made him yelp. I was glad I had taken some Dramamine before I rode it, both because of the motion and the nature of the pretty spectacular special effects might have made me queasy otherwise. 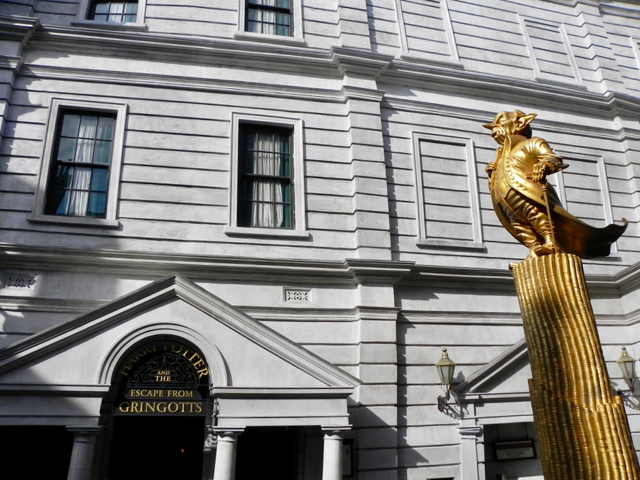 Just up the alley from the bank proper you’ll find the Gringotts Money Exchange. 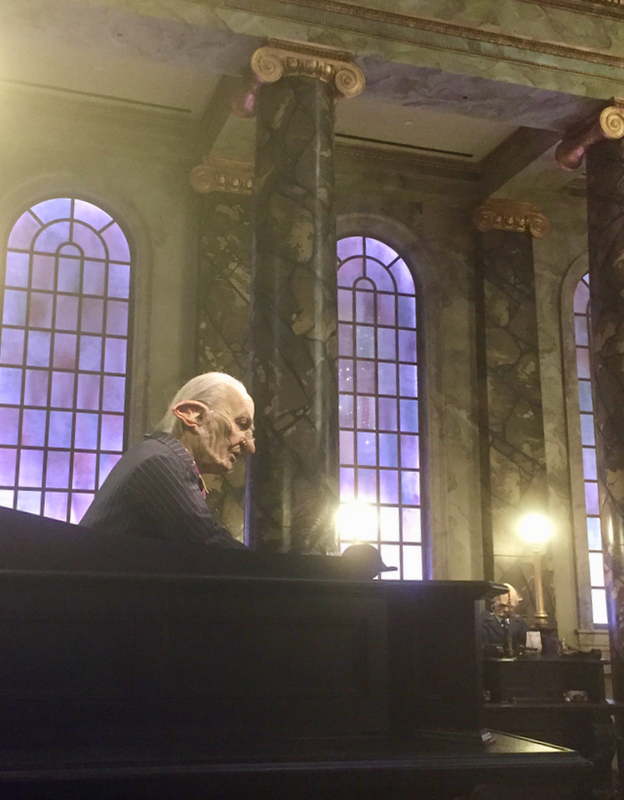 Pop in there and change some of your cash into official Gringotts Bank Notes that you can use around the park. While you’re in there, be sure to ask the goblin behind the desk if he is a house elf. 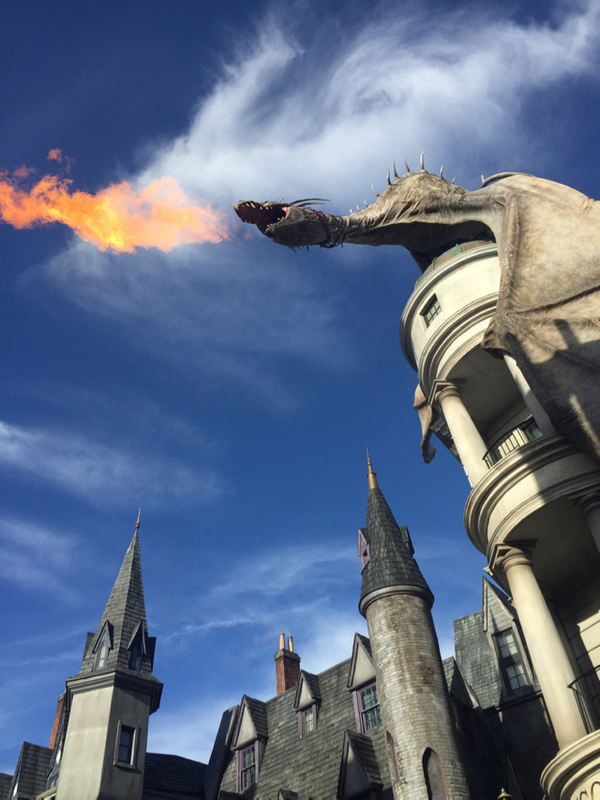 Word to the wise: You never quite know when the dragon on the Gringotts roof is going to breathe fire. The building rumbles throughout the day, but that doesn’t always precede a fiery show even if the street will suddenly be full of people with their cameras and phones trained on the dragon’s mouth. After some unsuccessful attempts where I just missed the flames, Matt was lucky enough to catch him in action. 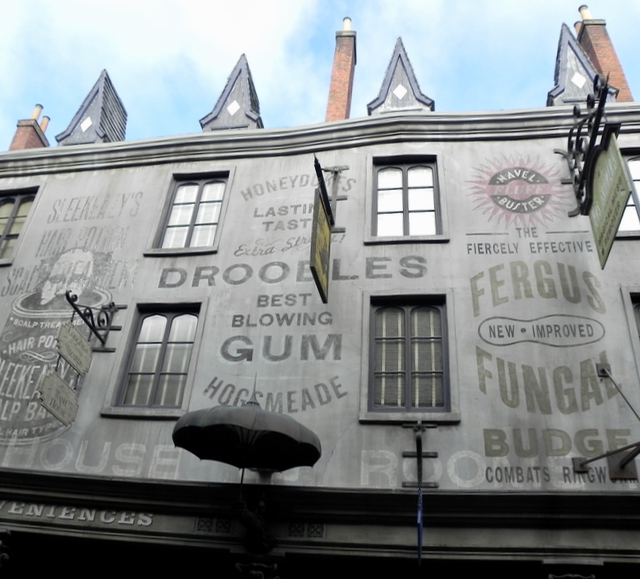 There are small details everywhere you look in Diagon Alley, so if you’re like us you’ll want to come back a few times to wander around and look in all the windows. Among my favorites was the Museum of Muggle Curiosities, which displayed items like a fan and a rotary telephone. 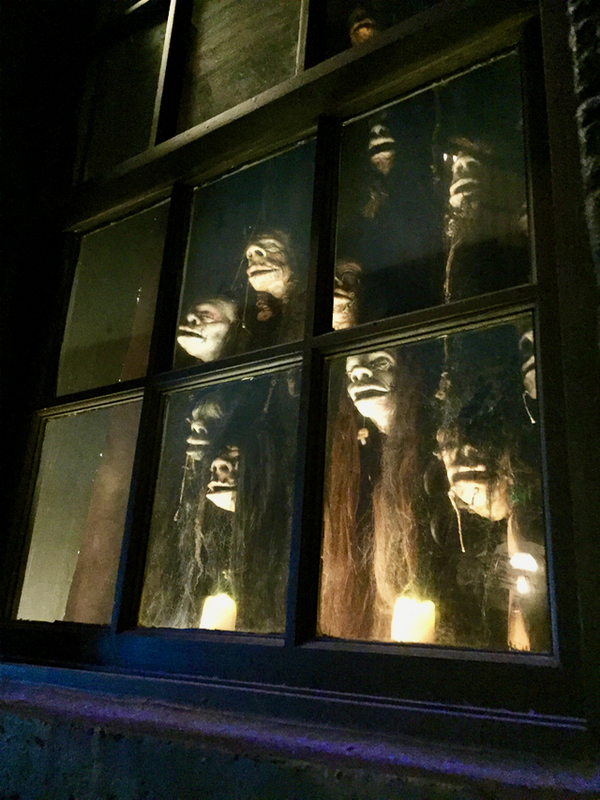 In the appropriately dark and creepy Knockturn Alley you’ll find a window full of singing shrunken heads. As Borgin and Burke’s the shelves are full of items designed for dark magic. It’s also home to the famous Vanishing Cabinet. We didn’t try stepping inside to see if we ended up at Hogwarts. 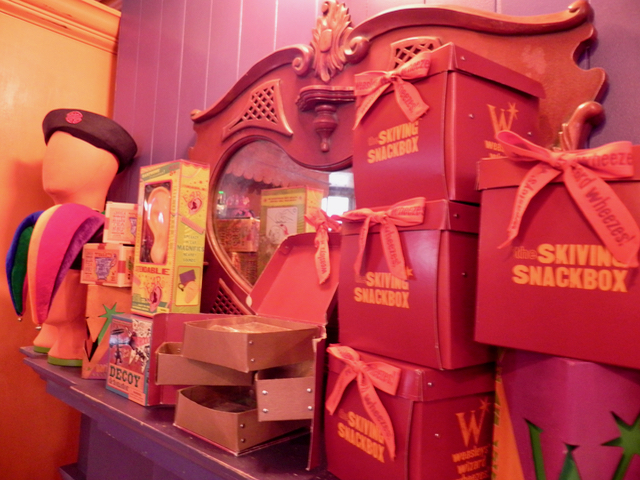 There is also tons of retail in Diagon Alley, from Quidditch scarves to Christmas sweaters like Mrs. Weasley made for Ron and Harry to Extendable Ears to Chocolate Frogs. It’s fun to go into the different shops and see what’s on offer and what surprises lie in wait. In Madame Malkin’s the mirror talks back to you; in Weasley’s Wizard Wheezes every time someone buys a Pygmy Puff the store erupts in celebration and a clanging of bells. 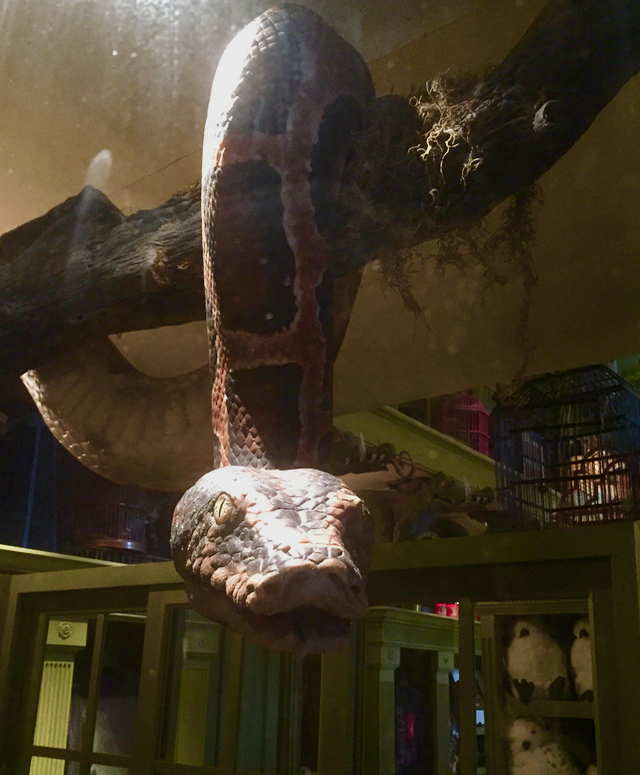 In the window of the Magical Menagerie a large snake will speak to you in Parseltongue (hopefully that glass stays in the window all the time). After spending time in the shop admiring the owls and toads, we ended up walking out with a Hungarian Horntail. At least it wasn’t life-sized. Butterbeer comes in a variety of forms at the Wizarding World and they are all utterly delicious and satisfying. At the Fountain of Fair Fortune we sampled the straight-up cold version, which comes topped with a creamy head of foam that is weirdly addictive. You will for certain get some on your nose as you try to dig out every last dreg at the bottom of your cup. 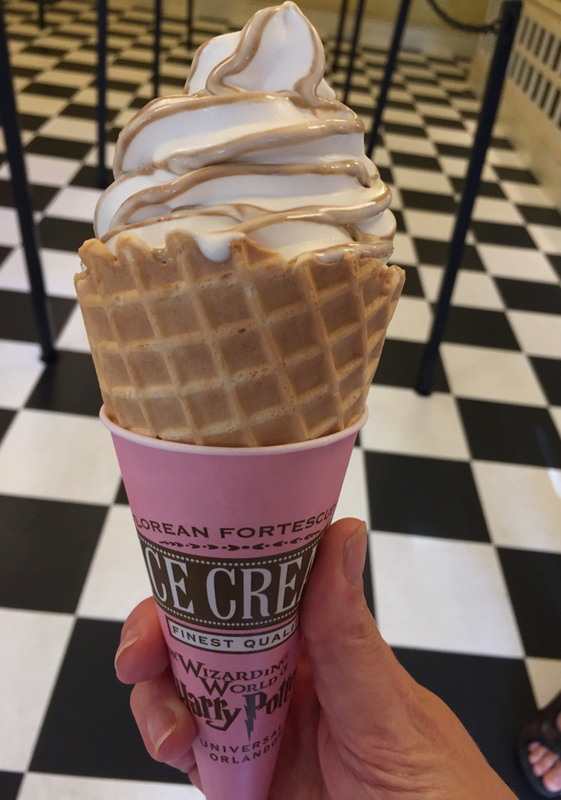 In addition to the beverage, we tried the soft-serve ice cream variety at nearby Fortescue’s Ice Cream Parlour. You can also dine on British specialties like bangers and mash at the Leaky Cauldron, located as it should be near the entrance to the alley. 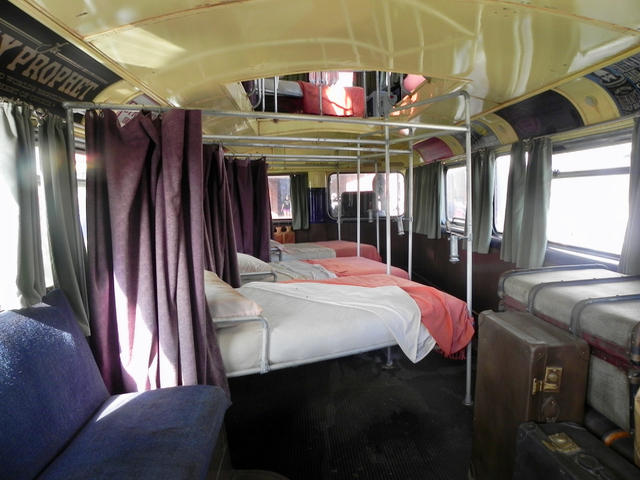 The Knight Bus is parked outside the entrance to Diagon Alley, its beds just waiting for a weary traveler or two. Tommy and I agreed that it didn’t really look all that comfortable. Stan Shunpike is standing at the door ready to say hello and pose for pictures, although he doesn’t like it if you ask about “He-Who-Must-Not-Be Named”. His sidekick the shrunken head finds that question quite hilarious though. 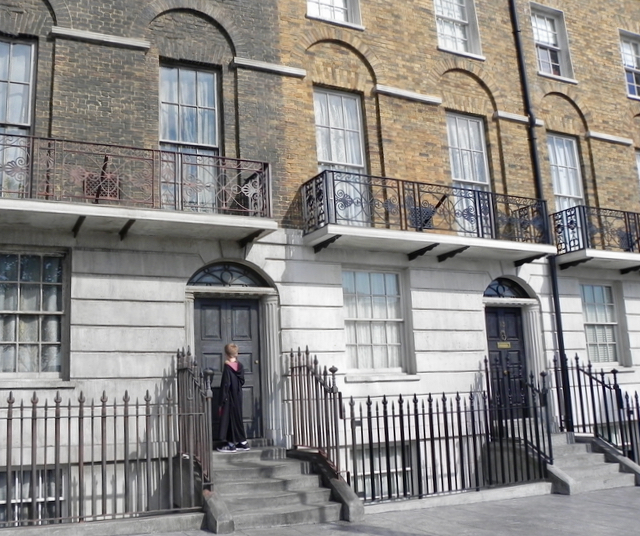 We also made sure we paid a visit to nearby Grimmauld Place, also just outside the entrance to Diagon Alley. I didn’t quite get a photo of it, but when Teddy knocked on the door of Number 12 we’re pretty sure that Kreacher pulled the curtain aside and glared at us. 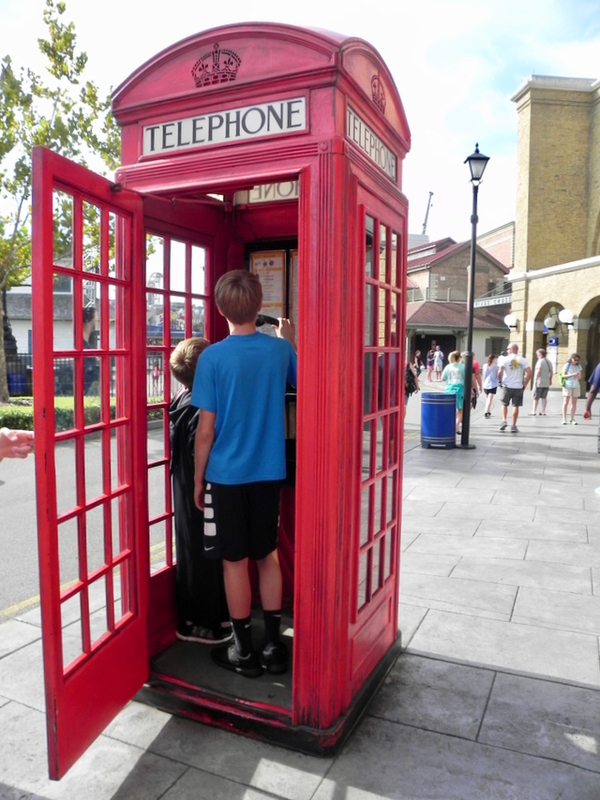 We never did reach the Ministry of Magic from the phone booth on the sidewalk here. That may partly be because neither of my children actually knew how to dial an “old-fashioned” telephone. Or maybe it was because we were in a hurry to catch the train at King’s Cross Station. We still had a lot to see of course, between Hogsmeade and Hogwarts Castle. 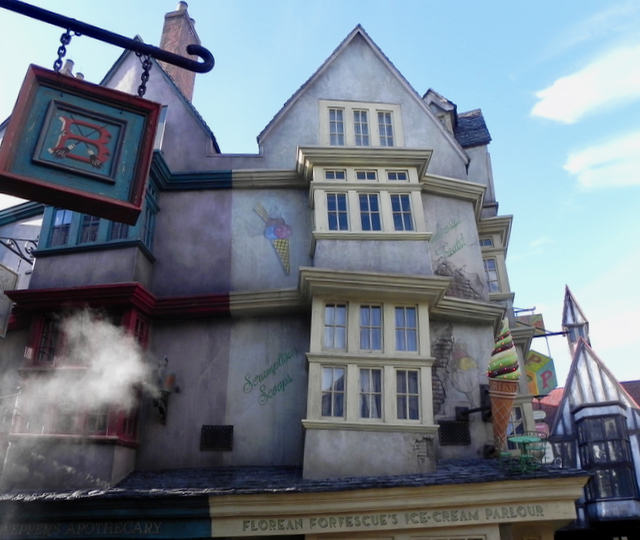 Stay tuned for more posts about our Orlando trip and our visit to the Wizarding World of Harry Potter, including our efforts to tame a Hippogriff in Hogsmeade, our verdict on pumpkin juice, which truth be told has always sounded kind of yucky to me, and our visit to Honeyduke’s. I’ll also give you my scoop on theme park dining (spoiler alert: it was better than I thought it would be), tips for making a visit to Universal Orlando easier and more fun and my thoughts about this type of family vacation. 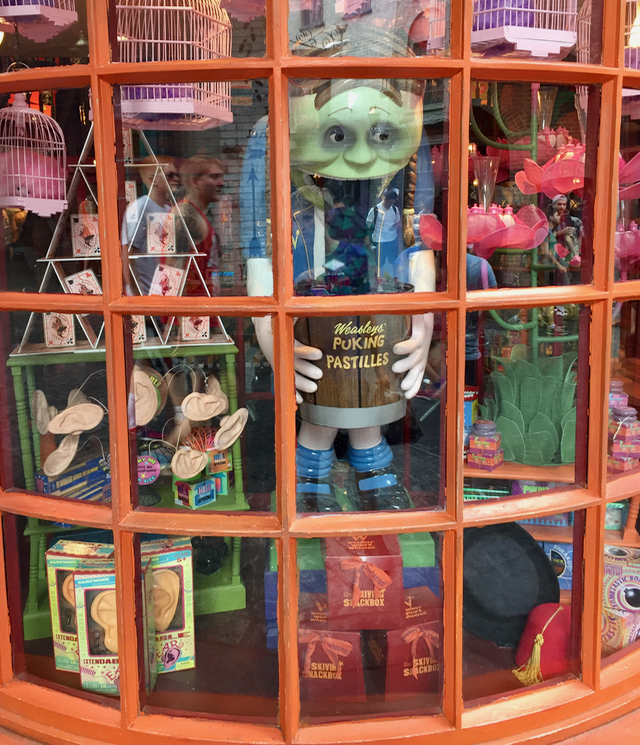 If you’re looking for stories and tips about visiting Univeral Orlando, be sure to check out my Universal Orlando Pinterest board, where I’ve shared lots of posts from other bloggers. And if you’d like to learn more about where we stayed, be sure to check out my review of the Sapphire Falls Resort on the Ciao Bambino website. Many thanks to Universal Orlando Resort for giving us four two-day, two-park passes and four nights of lodging. You can always count on me to tell you when I’ve received something and also to share my honest opinions. Great post that brings back memories of everything we found so magical on our trip last year! Can you detail how you shopped for your best park and hotel package? With out without airfare too? I am so excited for my eleventh birthday! I will be going to Hogsmeade and Hogwarts! P.s. Dumbledores wand is actually THE ELDER WAND!! ?